A matcha lemonade is a refreshing and sweet green version of the classic half tea, half lemonade iced summer drink. Ahhhh, that crisp, sweet taste of lemonade. What makes it better? Matcha of course! You’ve probably had the classic Arnold Palmer drink that’s half tea and half lemonade mixed together. My version is made with matcha instead of black tea. The sweetness from the lemonade is a perfect foil to the slight bitter taste from the matcha. Matcha is a Japanese green tea, processed in such a way so that it’s finely ground into powdered form. The work involved is a lot more labor intensive than other types of green teas so it’s a lot more expensive. Look to spend $15 – $30. The brighter the green, the more expensive. For this recipe, you don’t need the most expensive. Try a lower priced matcha if you’re shy about spending too much. Any wide-mouth container with an air-tight lid will do. I love the adorable square ice cubes this ice tray makes. 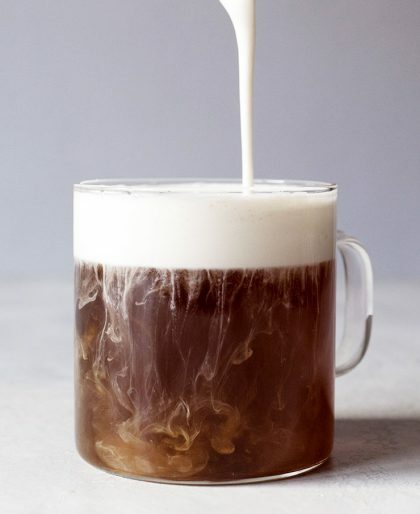 The first thing to do is to make a really simple simple syrup. Simple syrup is just 1 part sugar and 1 part water. Instead of boiling the sugar and water on a stovetop, I used my electric kettle to boil water then dissolved the sugar in the boiling water in a separate container. I do this part first since I want it to have enough time to cool down a bit before adding it to the other liquids. Next comes the juicing of a lemon. I like to use a citrus juicer since I usually make more than one serving have it makes the job easier. You just need the juice of one lemon for one serving. Make sure to take out the seeds. 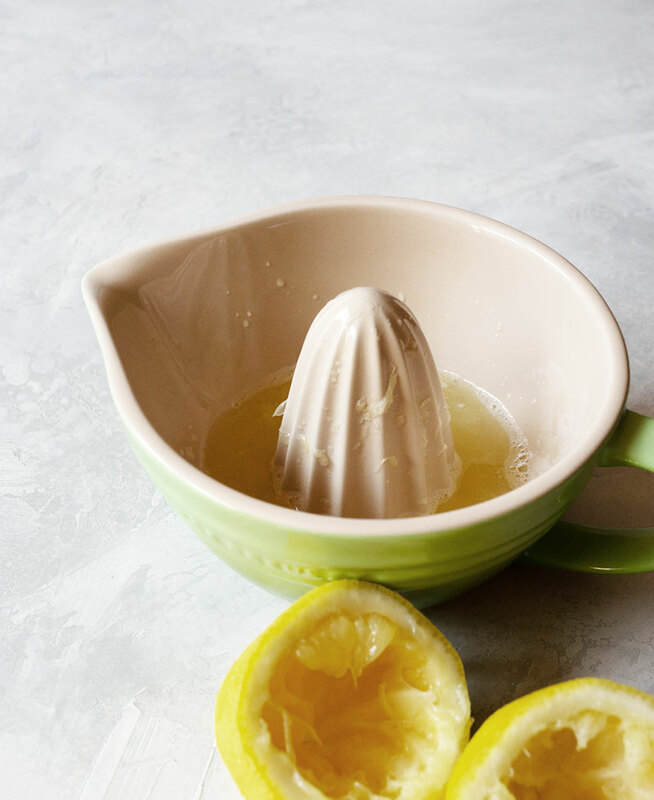 To make the lemonade, I use a cocktail shaker to mix the lemon juice, water, and the simple sugar together. Shake, shake, shake the cocktail shaker. Pour the lemonade into a cup. Then add some ice. 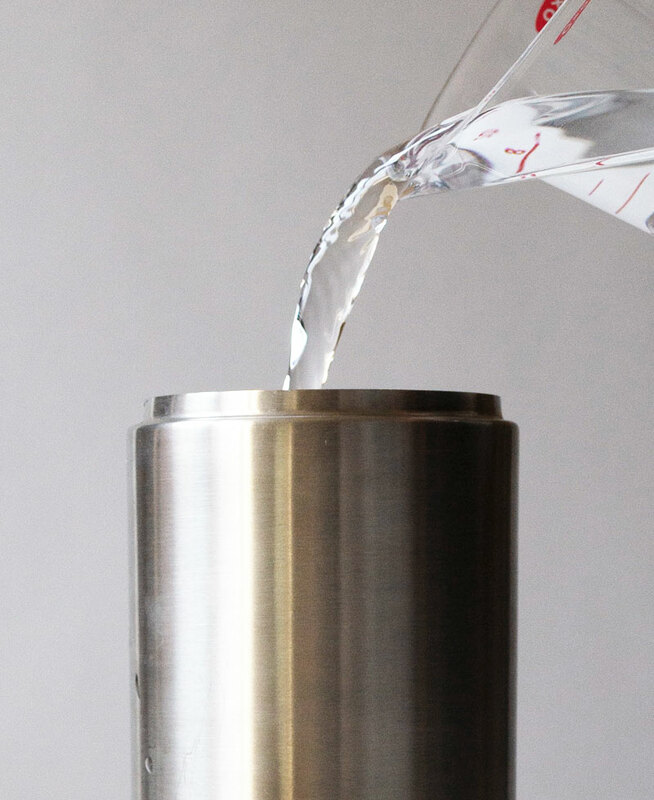 Give the cocktail shaker a quick rinse so that you can make the matcha. You want to make sure the water goes in first otherwise you may end up with matcha clumps stuck to the bottom of the cocktail shaker. Shaking for 10 seconds should do it. 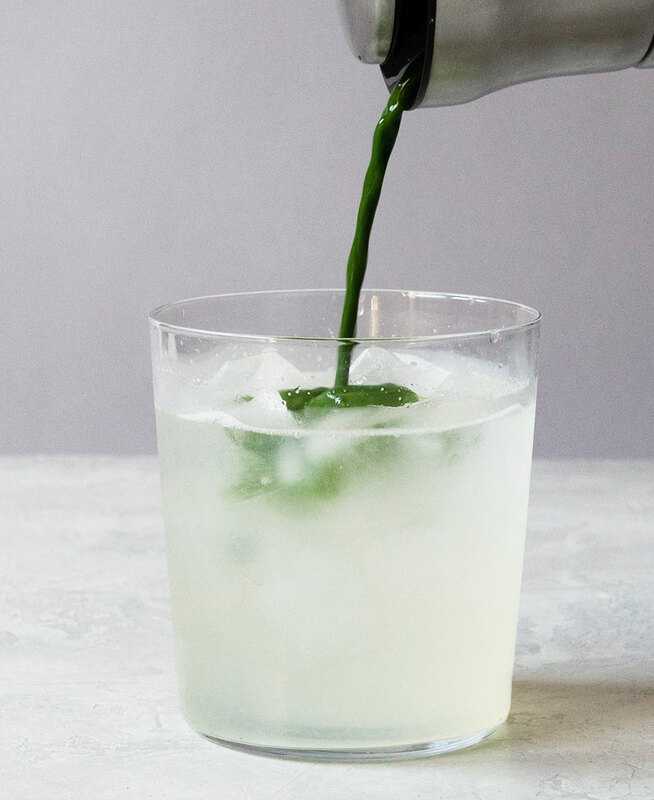 Pour the matcha into the lemonade with ice. Watch the green hit the lemonade! Top the drink with more ice and you’re done! 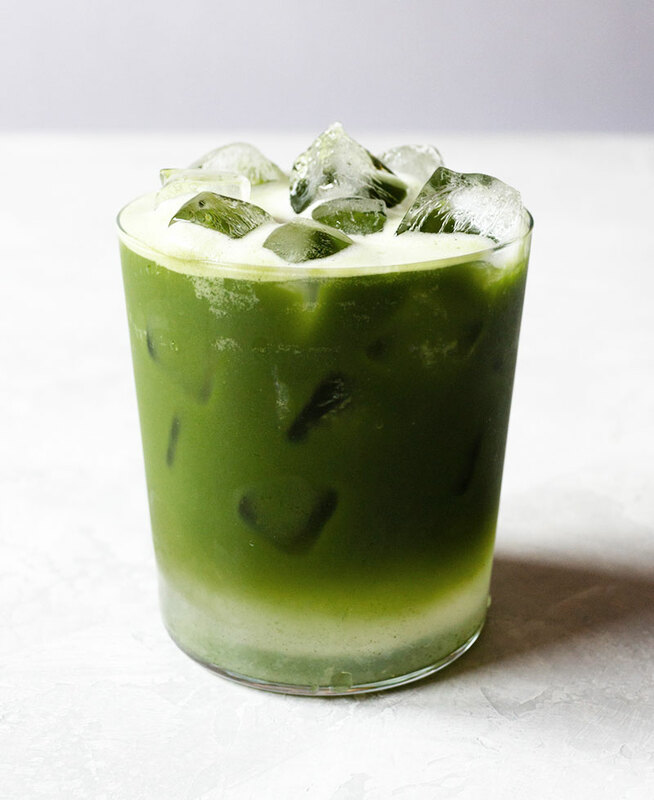 What is the Best Matcha to Use for Matcha Lemonade? 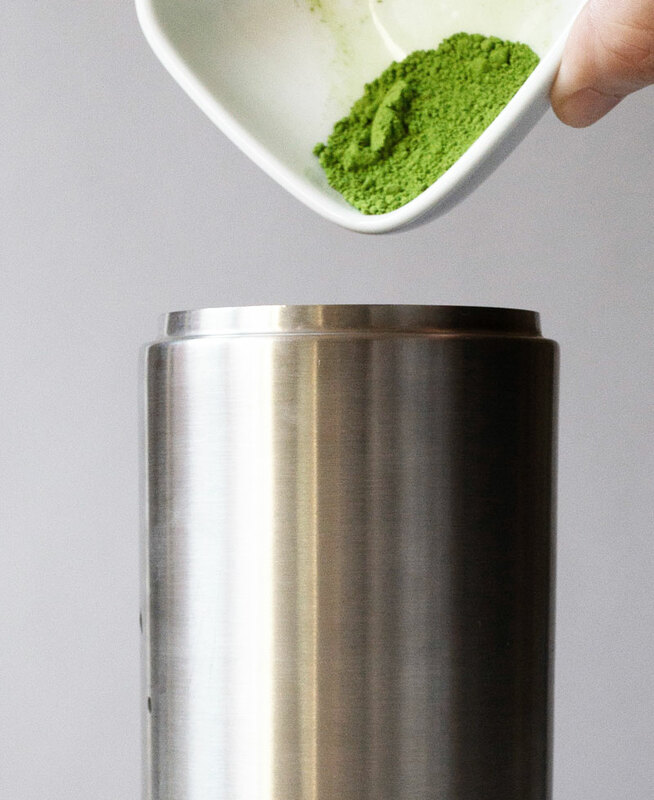 Matcha can range anywhere from $10 – $80 a package or tin. The more vibrant the green, the more the matcha will cost. 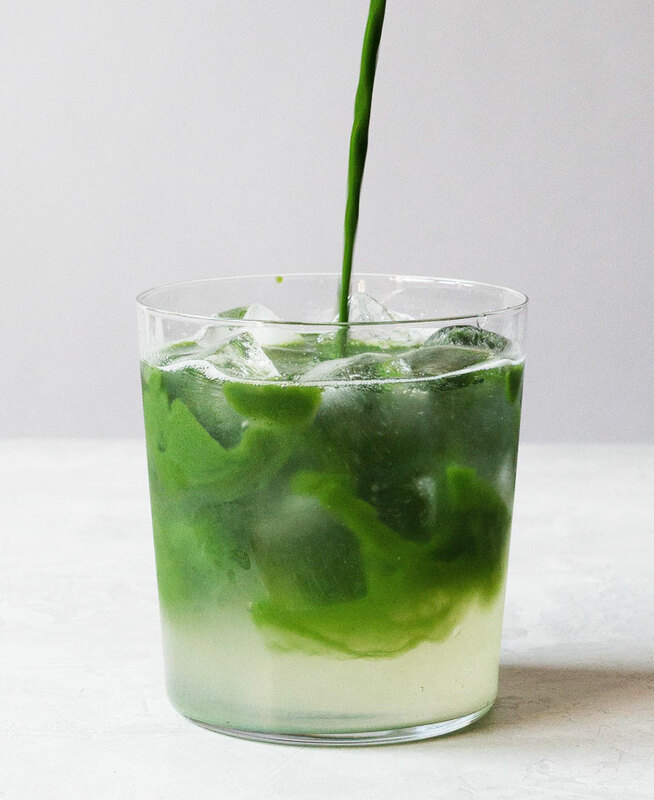 You want to use a nice green for this matcha lemonade, one that’s not too dull in color but you don’t want to get the most expensive. 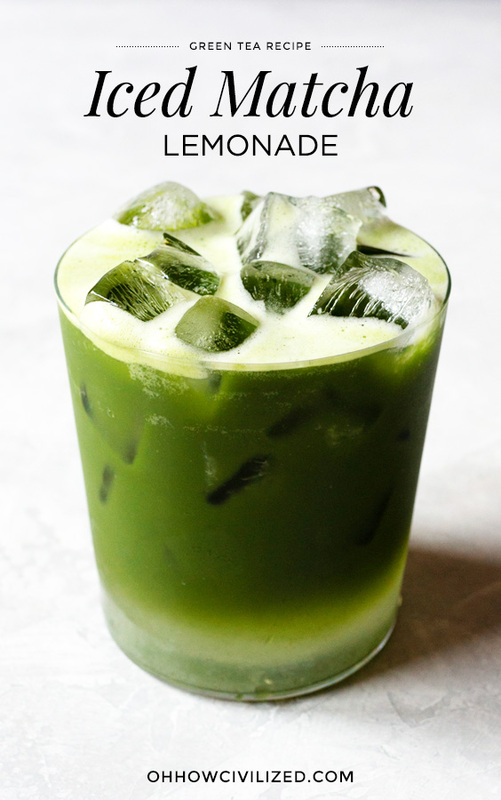 The really expensive matcha in the $40 – $80 range would be wasted on this drink since it’s mixed with lemonade. Save the really pricey stuff for drinking it straight with just water to get the full effect of the subtle notes of the tea. 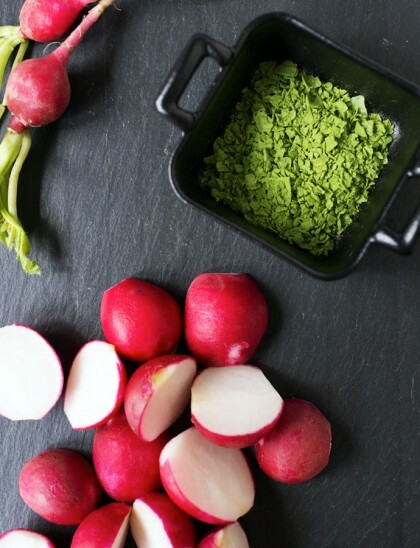 Matcha in the $20 – $30 range is ideal for this recipe. 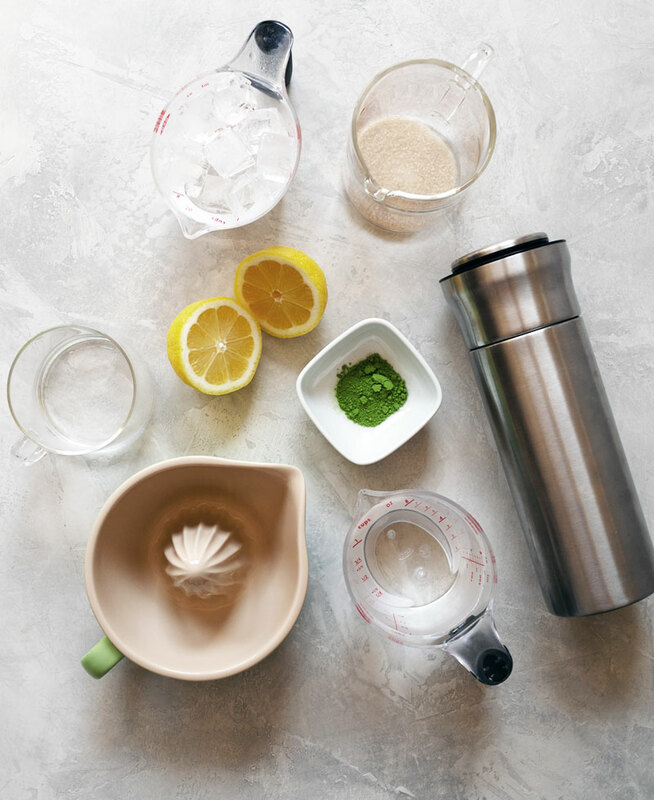 Get matcha priced in this range when using it for recipes, lattes, or anytime you need to mix matcha with any other ingredients other than water. 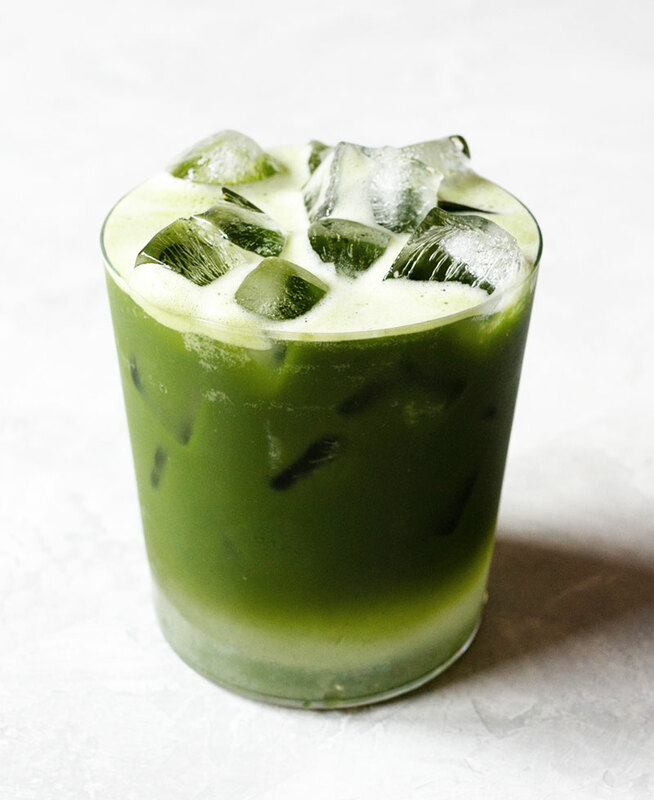 How Do I Make a Layered Matcha Lemonade? Sugar is what creates the separation and the layered effect. For this recipe, I poured the lemonade in first since it was sweetened with sugar, followed by the matcha which has no sugar. By doing this, I was able to create a layer of lemonade then a layer of matcha. I didn’t add a lot of sugar to my lemonade which made the separation less extreme. If you want more of a separation and layered effect between the lemonade and the matcha, add more sugar to the lemonade. 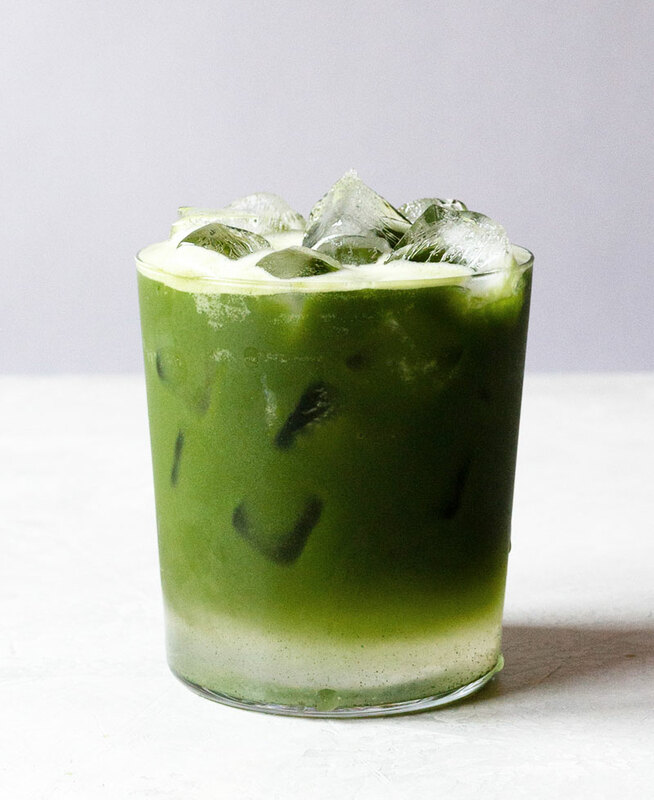 Can I Make Matcha Lemonade Without Sugar? No, a little sugar is necessary to sweeten the lemon juice to make the lemonade. If you don’t want to use refined sugar, use diluted honey instead by melting 1 part honey to 1 part hot water. A refreshing and sweet green version of the classic half tea, half lemonade summer drink. 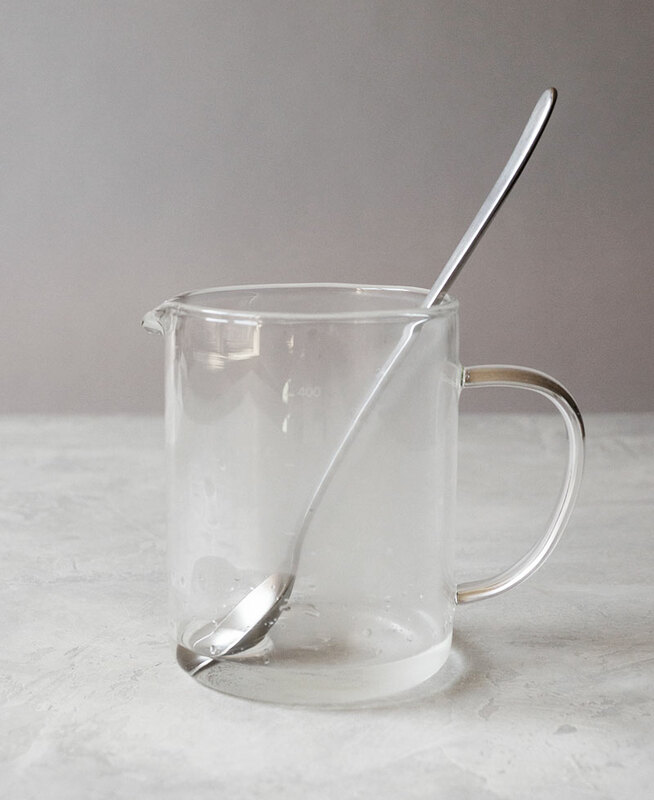 Make simple syrup by stirring sugar into equal part hot water. 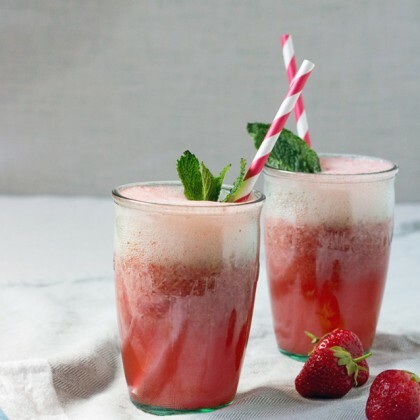 (To create more of a layered effect, add more sugar.) Set aside to cool. 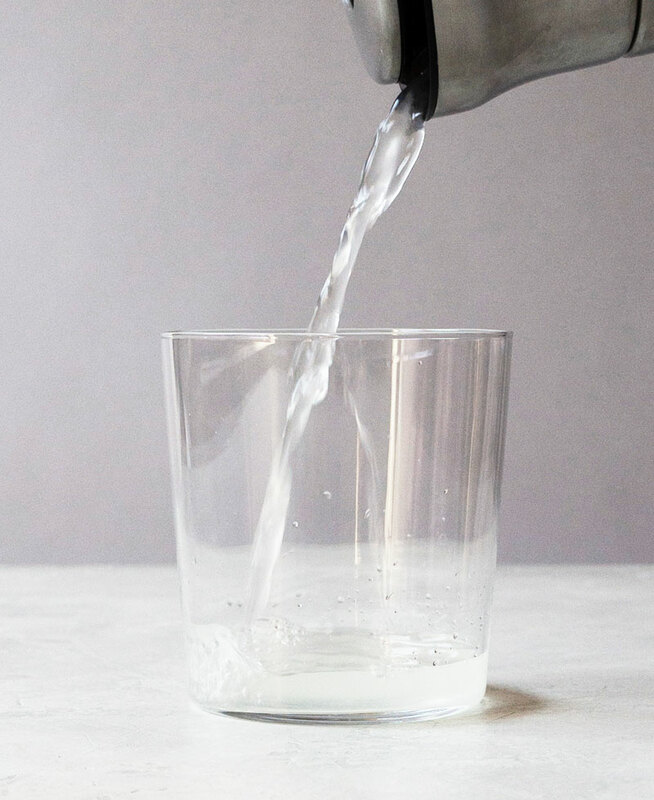 Into a cocktail shaker or a wide-mouth container with a tight lid, pour in 1/2 cup cold water, juice of one lemon, and the simple syrup. Give it a good shake, about 10-15 shakes. Pour lemonade into a cup and add ice. Rinse the cocktail shaker with water. 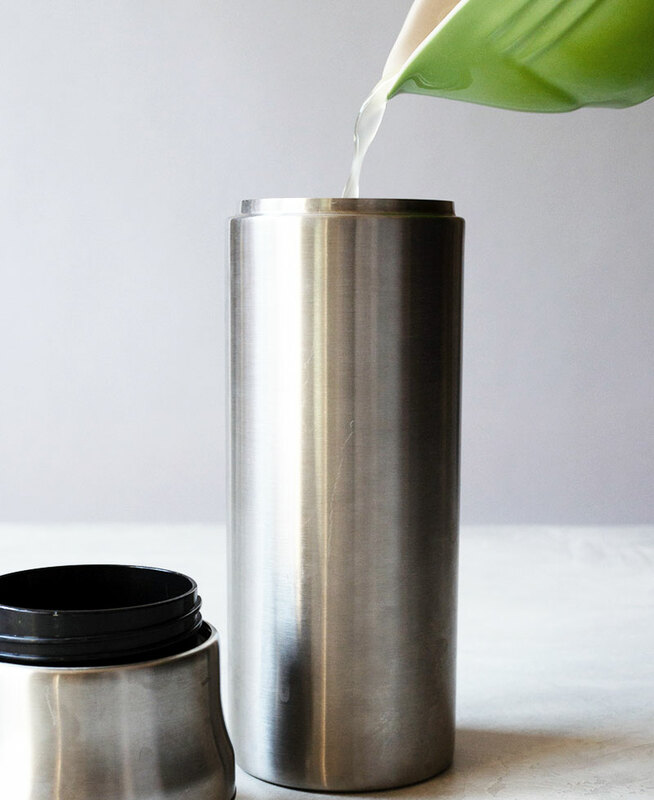 Make the matcha tea by pouring in 1/2 cup cold water and matcha into the cocktail shaker. Shake for 15 - 20 seconds. Top lemonade with matcha. Add more ice if needed.